I’ve never really cared for scrambled eggs. 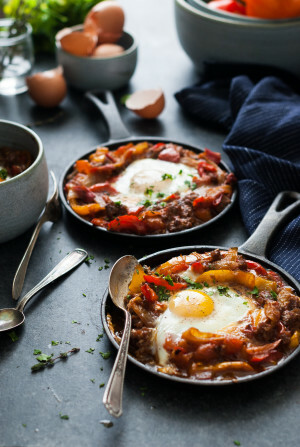 I’ll admit – I’ve never been a big fan of egg dishes, period. Until I discovered that they were absolutely incredible when given the proper cooking techniques. Everyone has they’re preferences and I prefer my eggs gently cooked. Whether they’re soft boiled, perfectly poached, or sunny side up, if they have a just firm white and a runny, creamy center, I’m a happy camper. 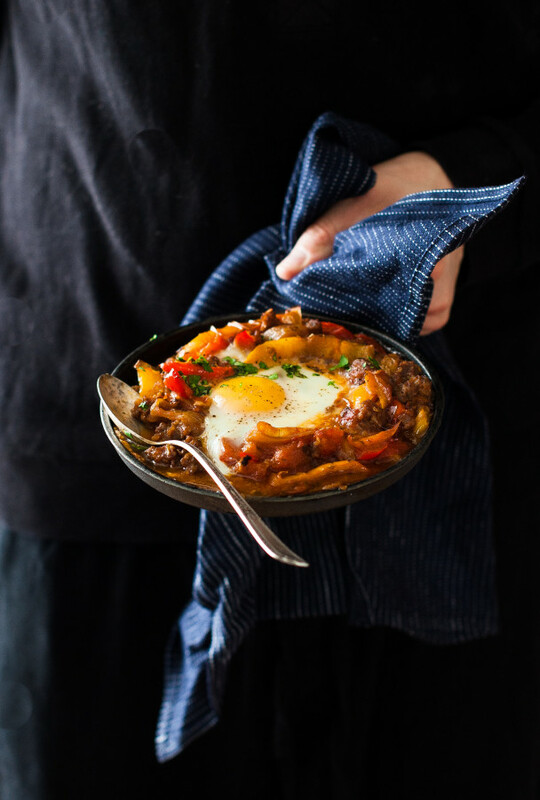 This discovery has led my to often preparing eggs in these styles for weekend breakfasts. 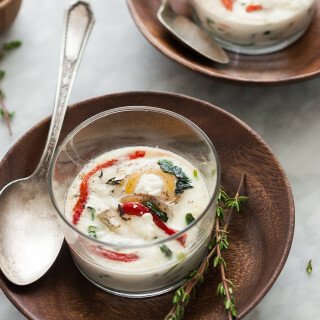 Softly cooked eggs are so elegant and luxurious, the weekend is the perfect time to make them since I have the time to devote to making them properly. Not that they take terribly long to cook. But weekdays involve rushed breakfasts of yogurt, toast, or cereal as I rush to get kids dressed and out the door for school. 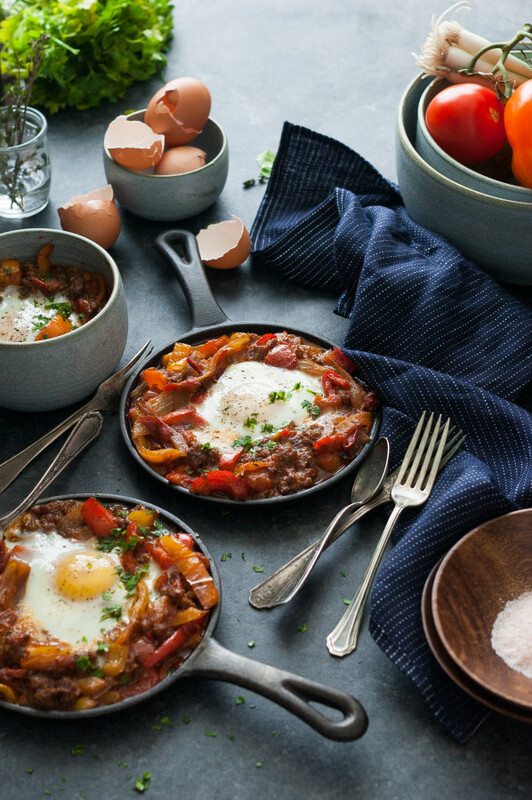 Among my favorite of egg dishes is Shakshuka. I only recently came across it as I had never heard of it before. 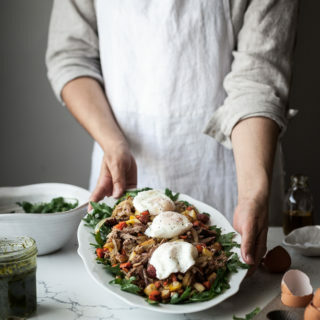 While flipping through Yotam Ottolenghi’s Plenty, I stumbled across a picture of the most fabulous looking egg dish – this Shakshuka. I tried it out and found it to be simple, yet incredible. Shakshuka is basically a dish of saucy, sauteed peppers, tomatoes, and onions that have been seasoned with herbs and spices then topped with an egg and gently cooked. 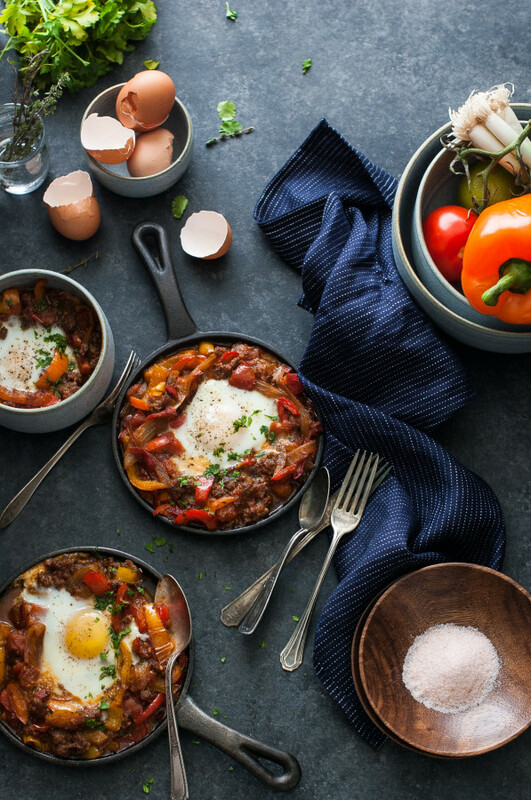 There are all sorts of variations on Shakshuka, and this one seems perfectly basic, balanced and delicious. I’ve stirred things up a little here and added in sausage. 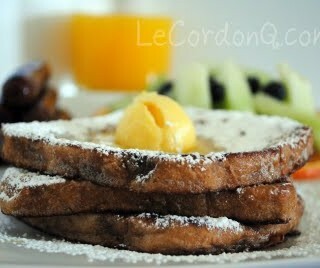 Someday’s you need a little more heartiness in your breakfast, you know? If you wanted to keep the dish vegetarian, just omit the sausage. Watch your eggs carefully in the oven. You want the whites to be just set and for the yolks to be runny. They can quickly go from creamy to over-cooked, so be aware of them as they cook. Add 2 tablespoons of the olive oil to a large saute pan and heat to medium/high. Add the sausage and cook, breaking into crumbles, until thoroughly cooked. Remove the sausage from the pan and set aside. Add the remaining olive oil to the pan. Add the onions and saute for 5 minutes. Add the peppers, cumin, sugar, bay leaf, thyme, parsley, and cilantro and saute for another 5 to 10 minutes, or until they are nicely caramelized. Add the garlic and saute for an additional 30 seconds. Add the tomatoes, saffron, cayenne and a little salt and pepper. Reduce the heat to low and cook for 10 minutes. While they are cooking, continually add a little water to that the mixture develops a 'pasta sauce' sort of consistency. Taste the mixture and add more salt and pepper as needed. Stir in the reserved sausage crumbles. Remove the bay leaf. Preheat the oven to 350 degrees. Divide the mixture between four small skillets or oven proof dishes, making a shallow well in the center of the mixture. Place the skillets or dishes on a baking sheet. Crack an egg into the center of each dish. Sprinkle the eggs with salt and pepper. Bake int he preheated oven for 8-12 minutes, or until the egg white is set but the yolk is still runny. Garnish the skillets with a little finely chopped parsley and serve.